Anthem® Electronics Blog | News & Updates: Anthem MRX 310, 510 and 710 Win Secrets of Home Theater Best of 2014 Awards! 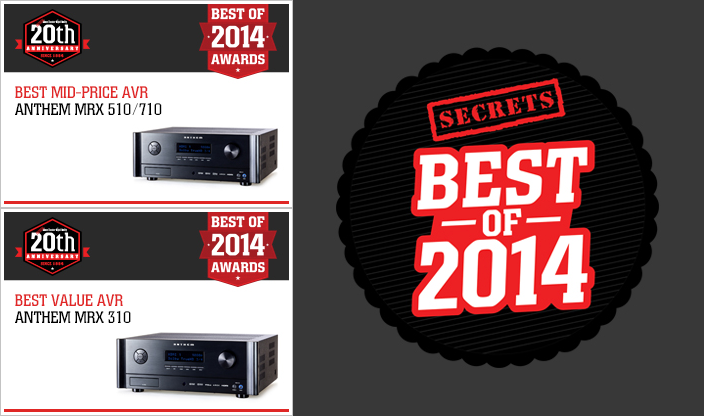 Anthem MRX 310, 510 and 710 Win Secrets of Home Theater Best of 2014 Awards! We are incredibly proud to announce that the Anthem MRX 310, 510 and 710 all won Best of 2014 Awards from Secrets of Home Theater & High Fidelity! The MRX 310 won for "Best Value AVR" and Best Mid-Price AVR went to both the MRX 510 and MRX 710! Click here! to see the Secrets Best of 2014 award winners. Click here! to learn more about Anthem MRX A/V receivers.